But When Will We Get Yamcha? Jump Force leaped onto the scene with underwhelming reviews, including ours. Regardless, Jump Force will continue trucking on and follow through with its plans for the future. Yesterday, Bandai Namco tweeted a roadmap for 2019. From April through August, Bandai Namco has plans on releasing both paid and free DLC. The content includes avatar costumes, new fighting arenas, events, and playable characters. The big star of the announcement was Seto Kaiba. He is the first and only named Jump Force DLC character. Kaiba, along with two other characters, are expected to be part of May’s paid DLC pack. A few weeks ago, a dataminer uncovered a list of characters allegedly being added to Jump Force as DLC. The files included Seto Kaiba, so his announcement was not really a surprise. The list also names Toshiro Hitsugaya and Grimmjow Jaegerjaquez from Bleach, All Might and Katsuki Bakugo from My Hero Academy, Biscuit Kreuger from Hunter X Hunter, some form of Buu from Dragonball Z, Madara Uchiha from Naruto, and Trafalgar D. Water Law from One Piece. The roadmap only include six characters including Kaiba, but there are nine characters dug up from the datamining. Maybe Bandai Namco is saving some for 2020. Get ready to unite with more manga characters on new stages & with new avatar costumes! 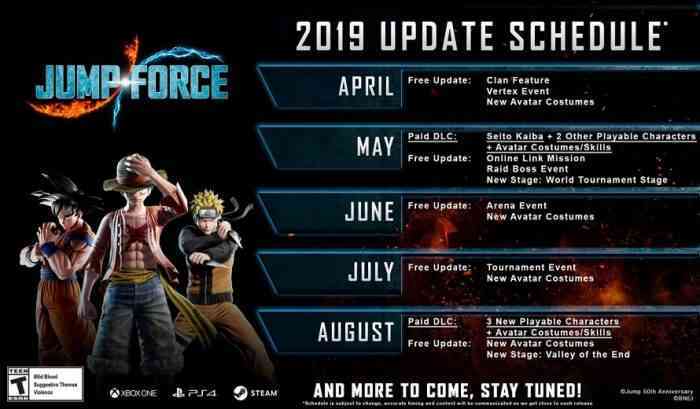 Here’s the road map for updates in #JUMPFORCE 2019. Jump Force is also notoriously sausagefest-y. Out of the forty characters in the base game, only three of them are women. Biscuit Kreuger is the only female DLC character, unless we get the femme-Buu. Why can we not play as characters like Sakura or Tsunade from Naruto, or Android 18 from Dragonball Z? You still have time, Bandai Namco. Will you be picking up any Jump Force DLC? Let us know in the comments below.